As soon as your cuddly little baby gains mobility, he or she would love to crawl all over your home. It seems all babies just love to get in trouble; especially at home. It is almost impossible to tell when they will start crawling, walking or even start climbing on the steps or railing. Thus, experts suggest that ideally you should baby proof your home even before the baby arrives, and before you get caught up in handling a newborn. 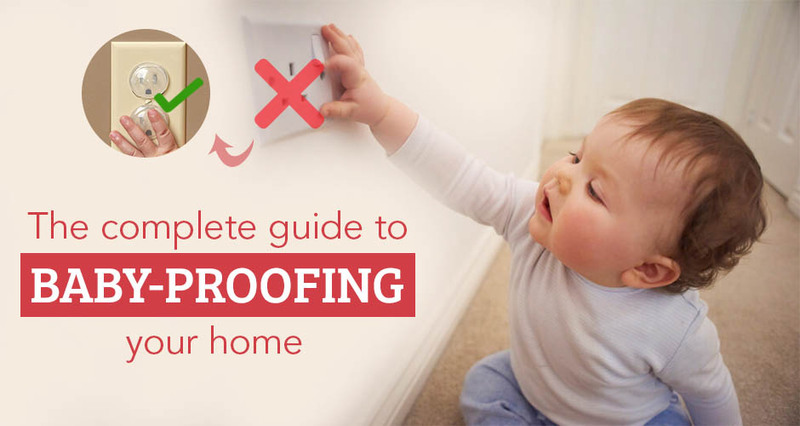 Learn everything about baby proofing here. First of all, you need to understand what baby proofing is. It is a simple but very important process of making everything at your home safe for the baby. Baby proofing makes sure that anything that can be opened, pulled on or played with will not harm your child. Also, it involves making sure that everything related to safety is working like a smoke alarm and CCTV cameras etc. So how much time will you need to complete the baby proofing process? Generally, if you spend just one weekend, it will be more than enough. Once you are done, you can relax and have to worry much lesser about keeping the baby safe from injuries that can occur because of sharp edges or falling from the stairs. In this article, we will discuss the baby proofing process room by room to make sure your home is completely secure. Let’s start with the bigger picture. The first step is not to go from room to room but to make the basic changes in your home to make it safer for the baby. First of all, make sure that the hot-tub temperature or the temperature on your water heating appliance is set to 120 Degree F or 48 Degree C at max so that the baby does not get any burns. After that, make sure that there is a fire extinguisher in your kitchen. The next step is to cover all the electric outlets. For some weird reason the kids when they start to crawl put their tiny fingers in everything. Electric outlets are one of the main reasons of accidents at home for kids. In the room or basement where you wash your clothes and keep the cleaning agents, everything should be at a height where the kid can’t reach. A very important part of baby proofing is to remove or minimize sharp corners and surfaces. Baby proofing pros suggest that you get down on all fours to get a better idea of what hazards, your baby could face while walking or crawling. Any objects that are sharp and can be easily broken when handled by a baby need to be placed up high, try to pad up any sharp corners of furniture and remove or secure any items that the baby can pull over. This is one place where the parents spend a lot of time and often kids follow them there. Also, the kitchen is one place where you will find the sharpest objects like knives and forks. While baby proofing your kitchen, make sure to install baby proof locks on the cupboards. Make sure that the stove and gas connections will remain closed when not in use. Fridge, microwave etc. should be placed on such counters where there is no risk be baby proofed properly. You can find special attachments to keep them locked, at your nearest hardware store. Also, make sure to keep the jars and utensils out of the reach of the kids. You may think that there is nothing in your living room that can harm your child. Unfortunately, you are completely wrong. The crawling kids can not only climb on the furniture but they can also pull mirrors even televisions towards them resulting in serious injuries. Every year hundreds of children suffer from acute trauma because of the falling furniture. Baby proofing the furniture is the most important part of the process. Also if you have stairs leading from your living room or any other part of the house, you need to be doubly careful. You can either ensure that areas with stairs or other falling hazards are completely out of reach of baby all the time or you can choose to install baby safety gates which are easily available online. The next step is to baby proof the bathroom. Make sure you put latches on the cabinet and toilet lock on the seat and avoid keeping your buckets or bathtubs filled with water. Also keep a thermometer there to check the temperature of the water before you give a bath to your kid. To keep your child’s entry to the bathroom restricted, ensure that you install a door knob on the outside and keep it locked. Buy a skid proof bathroom mat to avoid risk of slipping. Ensure that any medicines and toiletries are locked inside cabinets. One very important thing to always remember is that you should never leave your baby in the bathroom alone. Install safety gates on all entries and exits. Make sure to remove any toxic plants from your home. Do not keep lighter, matchboxes etc in open space. Keep the liquor cabinet locked. Vacuum whole house regularly to remove paper clips and other choking hazards. Keep the makeup away from kids. You need to be very careful about choking hazards in every room, since babies have a tendency to explore new things by putting them in their mouth. Experts suggest that a good rule of thumb to follow is the ‘toilet paper roll test’. This basically means that you should not keep any items that can pass through an empty roll of toilet paper near the baby. Any item which is small enough to pass through a toilet roll, may get stuck in baby’s windpipe if ingested. Also pay close attention to age recommendations when selecting toys. The manufacturers label toys with details such as, ‘suitable for ages 3 and above’ , or ‘choking hazard. Avoid selecting such toys for your babies. By keeping these small points in mind you can ensure the safety of your kids inside your home. However, one thing you always need to remember is for small kids, constant adult supervision is the most critical aspect of ensuring their safety. Always be aware of where your child is and if you need to take a break or do a task, ensure that the baby is somewhere safe.